The so-called "flipped" campus prescribes that the mechanical details of engineering concepts be learned independently, while the faculty-led classroom experience be focused on synthesis and application of core concepts. In many academic circles, this is generating vigorous debate as we try to reconcile what we are all used to and have been trained to do, with the promised benefits of the flipped world. 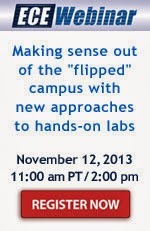 Dr. Tom Lee, Quanser's Chief Education Officer explores the concept of "flipped" campus and how it can enhance traditional undergraduate labs and help trigger improvements in education and research in an ECE Webinar on November 12. In his webinar, Dr. Lee will present a case for modern interpretations of the traditional hands-on undergraduate labs which can still offer a great opportunity for engineering schools to efficiently flip their classrooms and trigger improvements in education and potentially even research. The hands-on lab was, from the outset, an effort to introduce concept synthesis into the curriculum and it is the place where theory meets reality and practical insights emerge from the foundational theoretical knowledge. In essence, this is what the flipped classroom promises to do. The key difference, today, is that the flipped strategy inherently takes advantage of modern technology and media frameworks and if we are not careful, even the best among the traditional labs will become stale and ineffective. Dr. Lee will present new techniques emerging from institutions and industry that are enriching the modern concept of the lab and additionally, make these labs of the near future, a vibrant dimension of the flipped campus. He will discuss some of the techniques, including bonding strong industrially-relevant concepts to undergrad labs; frameworks for off-campus hands-on labs; and the role of mathematics and modelling in an enriched lab experience and illustrate them with case studies. Quanser is proud to partner with Electrical and Computer Engineering Department Heads Association (ECEDHA) to launch the association's new ECE Webinar series with an event on November 12.